In what’s become major news and a source of national outrage, thanks to months of reporting by the Associated Press, the New York Police Department has spent years investigating American Muslims throughout the Northeast. Of particular concern is an “NYPD Secret” document dating from November 2006; titled “Weekly MSA Report,” the document was created by Mahmood Ahmad of the NYPD’s Cyber Intelligence Unit, who as “a daily routine” visited the Web sites, blogs, and forums of Muslim Student Associations at the State University of New York at Buffalo, New York University, the Rutgers Newark campus, and, less frequently, similar sites at least a dozen other colleges, including Yale, Columbia, and Syracuse. It’s not uncommon at times like this that we talk more about the controversy than anything interesting or valuable going on just below the surface of our outrageousness or outrage. Yet if we look at Officer Ahmad’s cursory report of forthcoming events that had Muslim students atwitter in late 2006, we can see something of what matters to young American Muslims, and perhaps more importantly, who it is that’s been guiding them along a bumpy road this past decade. Those named in the report come as no surprise to anyone who might join a Muslim Student Association: Imam Siraj Wahhaj, Imam Zaid Shakir, and Sheik Hamza Yusuf. Here’s what I know. These three men, all converts, appeal to young American Muslims. They appeal, in large part, because they were born and raised in this country and have a vision for Islam that is unmistakably American. Though they’ve all spent time studying in Muslim-majority countries—Imam Zaid and Sheik Hamza were away for years—their focus remains on building a Muslim community that looks and feels, in every way possible, American. They are not alone, of course, and they do not always agree, but they have been in the vanguard over the last 15 years, at least; their students are just now growing into leadership roles of their own, compelled by the notion that the religion must adapt, within the norms of the tradition, to the culture of the lands where Islam has moved over the centuries. Committed to building things up and not tearing things down, Siraj Wahhaj, throughout the 1980s, revitalized his little corner of the world—the dangerous corner of Bedford Avenue and Fulton Street in the Bedford-Stuyvesant neighborhood of Brooklyn—through the efforts of his community at Masjid At-Taqwa, or the Mosque of God-Consciousness. When last December he celebrated the 30th anniversary of the masjid and raised funds to build a state-of-the-art community center in Brooklyn, including space for a school to serve hundreds of local kids, he invited not just Imam Zaid and Sheik Hamza but also called on the Brooklyn native, Muslim emcee and film star Yasiin Bey, formerly known as Mos Def, to offer his reflections on the neighborhood before the imam brought it back to life. It’s true, of the three Muslim leaders named in the NYPD report, Imam Siraj remains the least comfortable with modern American life, and especially modern American policing. According to the NYU adjunct law professor Paul M. Barrett, who writes about Imam Siraj in his book American Islam (Farrar, Straus and Giroux, 2007), he’s most inclined to think of law-enforcement allegations against Muslims as “evidence of a government conspiracy,” not one among the Muslims. My own interactions with Imam Siraj suggest he’s eased up in recent years. It’s also worth noting that his effort to clean up the crack houses of Bed-Stuy was met with high praise by the NYPD. The Brooklyn borough president honored the imam with an official Siraj Wahhaj Day on August 15, 2003. Imam Zaid, who like Imam Siraj is African-American and who also has roots in poor, urban neighborhoods, has been likened to his hero Malcolm X. 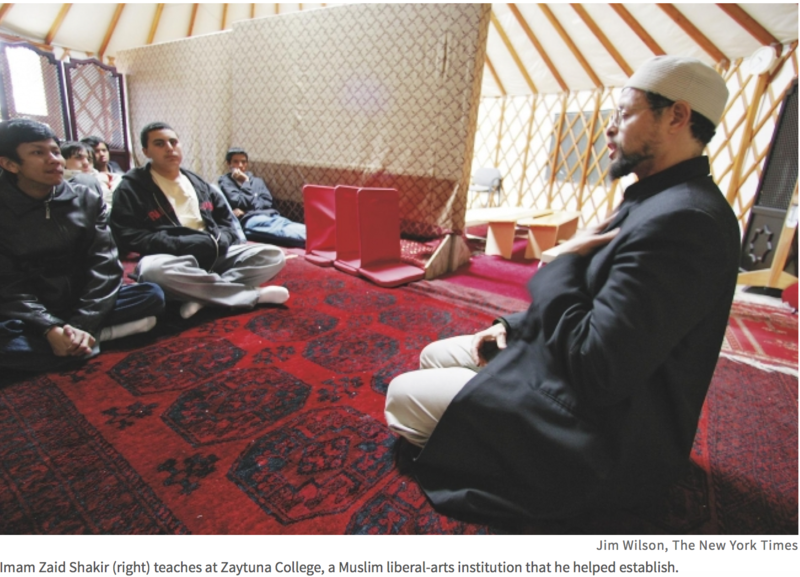 Born Ricky Mitchell in Berkeley, Calif., and raised in housing projects from Georgia to Connecticut, Imam Zaid, with Sheik Hamza, went on to found Zaytuna College, the nation’s first four-year Muslim liberal-arts institution. Embodying an American story if ever there was one—including proverbial bootstraps, military service, political activism, and deep religious commitment—Zaid Shakir draws young Muslims to himself because his message of social justice in the face of poverty and racism he has known first hand makes him endlessly and, it often seems, effortlessly relevant. He is as approachable a man as I’ve ever met; tall and somewhat too lean—he fasts one day per week—he’s all wingspan when embracing his followers at the mosque. To them he says, “Islam is calling us to be bigger than what the world has made us.” And they see in him—whether in his tirelessness, his intelligence, or his fire—a model. What makes the appearance of these three scholars on the secret NYPD document a “teachable moment,” as Sheik Hamza sees it—and so do I—has only partly to do with the enormous appeal of these teachers in their communities, especially among the young. Given the NYPD’s interest in them in the wake of September 11, 2001—an interest Sheik Hamza, for instance, understands and sympathizes with—what’s perhaps most important to grasp is that these hugely popular and widely influential Muslim leaders have time and again preached an anti-extremist message. “Islam doesn’t teach anarchy,” Imam Siraj declared on the stand when called to testify during a terrorism case in March 2001, “and people cannot take it upon themselves when they don’t like something, even though something seems to be unjust, to get up and do that kind of violence.” As for the NYPD, Sheik Hamza has said, we can’t simply fault them—“that’s too easy.” From his perspective, “It’s not us against the police. ... If those MSA-goers have an emergency, they’re still going to call 911.” We need the police. They just need to know that we don’t need them spying on peaceful, patriotic American Muslims. Three of the nation’s most relevant and influential Muslim leaders—Imam Siraj Wahhaj, Imam Zaid Shakir, and Sheik Hamza Yusuf—may criticize American foreign policy, especially in the Middle East; they may preach to the crowds gathered at Occupy Oakland and condemn the corruption in American markets and in American law enforcement. But then, public dissent is an American art. Indeed, the heroes these men call upon are just as often a Founding Father or a literary giant like Henry David Thoreau as they are a Muslim leader like Malcolm X. These Muslims, like Malcolm, are Americans. This is the land they’ve always called home. They’re building a tradition here that, against all apparent odds, they’d like to see last. And if they have a secret message, it’s this: To those who don’t like America, or who don’t want to be here, or who wish to do harm in our neighborhoods, it’s time for you to leave. To view this this reprint article written by Scott Korb go to: The Chronicle of Higher Learning: http://chronicle.com/article/American-Islam/131154/ He teaches writing at New York University and the New School. I need to say thanks to you with regards to your site. You have a considerable amount of engaging material so the site is worth your time. I am a undergraduate in The state of california and I currently have an vital term paper due in the week. Now i am tangled and have writers-block right now as I am researching. Just need a person to assist me modify the cost-free article I stumbled upon on the net &lt;a href="http://www.customessaymeister.com/customessays/Geography/104.htm"&gt;earthquake essay&lt;/a&gt;. That report fits my personal specifications however is authored in an unsatisfactory style and there are grammar problems. Do you think I would proceed? Now i&apos;m simply just in need of aid, and so any idea could be excellent. I must say this blog entry is worth reading. About American Islam whatever author mentioned seems to me brilliant view. I feel glad by learning a lot about American Islam from here. mobile DVR for vehicles Thanks and keep up sharing. So typical. Hamza sttirang off by saying , I want to start off by saying .. that he knows nothing about Rumi. His saying that was followed up by, I have read his poetry in translation and the Masnawi translated by Nicholson. How many people would still say that, feel that way, after having read so much?I mean, how many of us could, sincerely, be able to say something like that? He gives my understanding of how humility can look on the ground a whole new dimension. I have read the complete (6 volumes) of the Masnawi 3 times and I can assure anybody who listens to this that Hamza has more understanding of who Rumi was, and what he was trying to convey, than I ever will. So he is going to speak of something else at this Rumi Commemoration. This unique gift to human beings Language. Words (he just loves words really) and poetry ..the highest and most subtle form of human communication. The Masnawi in Persian is an epic poem. The Qur an in Arabic is in poetry not prose.. A modern example: Rilke who is touching and powerful in translation. How much more so in German? Guess one would have to be German to know the full import of that. And, just because someone is German, or Persian or Arabic does not mean that they will necessarily get it .It sort of raises a question doesn&apos;t it? Assalaamu &apos;alaykum, Thanks for the article and may Allaah reward you with greater and greater guidance. It worries me that American Muslim leaders like you and Sheikh Hamza fall for the plots to redefine Islaam while calling it "normative","classical","traditional","adapted","American",etc.I am afraid that all these "modifications" will not achieve your aims with the enemies of Islaam-namely please them or give them an "acceptable" mutant Islaam.And at the end of the day you would be accountable before Allaah. Please read the Qur&apos;aan very hornestly and let "it speak" rather than telling it "what to say"!As for you I never really followed your speeches before 911,but I was,had and still benefit immensely from Sheikh hamza&apos;s speech from before 911.He was my hero.Unfortunately he has taken almost a U-turn.Very sadly he recognizes this too,says it but justify&apos;s it as "evolving","growing",etc fa innalillaahi wa inna ilayhi raji&apos;oon. My last advise,if you cannot pay the price of saying the Truth-persecution,jails,torture,etc simply keep quite Yaa Imaam and peacefully live Islaam as much as you can and die in peace. I appreciate the effort you made to share the knowledge. this is really a great stuff for sharing. We also provide assignment help Australia.